It was still dripping when we walked down onto the dock but with the temps well into the 50's and hardly any wind it really wasn't a hardship. 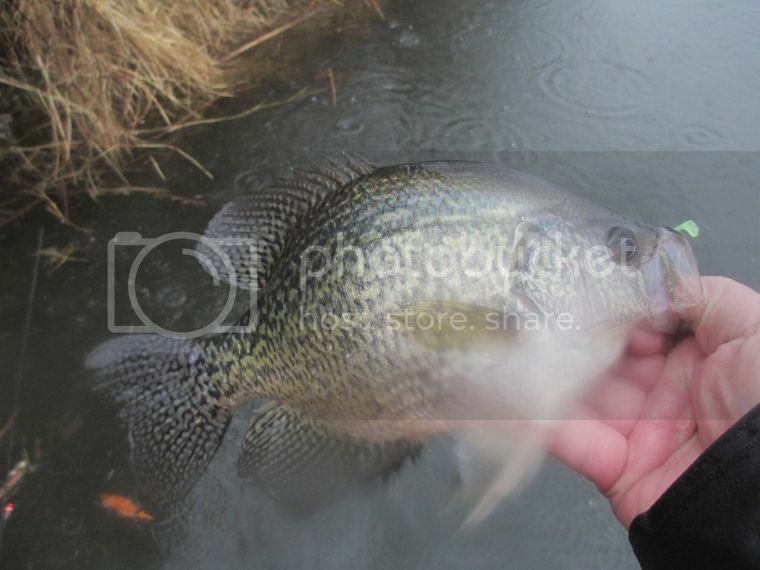 Each of us got a crappie on our first casts so that pretty much took our minds off the inclement weather. We fished for 3 1/2 hours and during that time landed right around 80 crappies and a couple super sized sunfish, one of which was just a hair shy of 11 inches. My buddy Ron has this thing for using waxies but he didn't have time to get into his stash of the little critters today. All plastic with three color combos holding court: purple/chartreuse tail, blue/chartreuse tail and gunmetal/chartreuse tail. The 1.5" Thump-It and a 1.5" stinger from bass tackle in those three colors kept us both very busy. The crappie shown here is about the smallest of those we caught today. Today was the first day a sunfish was taken from this dock this spring and it was also the first day any smallies were caught. I got three smallies, but none real large. about 16 inches was tops but not bad for a smallie at this time of year. In a couple weeks the larger fish will be all over this particular shoreline and then we'll see some 19 to 20 inchers. The big guys will be around for a week or so then they shift to deeper water and further down the lake until they are ready to spawn. The water temp was down one degree from last week's temp on the same day. The rain is supposed to usher in some weather changes that include snow flurries and colder air so this nice bite might be getting a door slammed on it. Its time for the boat now though and the next trip will likely be in that. Still, from a dock the fishing today was super. Glade that you had another great trip. It is sweet when you don't have to go far to get them. Nice fish!!! Always love to see your reports, Tom. As someone who knows when, where, why and how to catch bass at nearly anytime of the year I struggle with the crappie so to see someone who has the amount of success you do is refreshing! Usually, if I'm catching crappie it's by pure accident haha. I caught a nice slap crappie on a drop shot a few weeks ago in the same place I had just pulled up two nice spots and a little hybrid so it was interesting to see all those species grouped up on the same little transition bank. All I use on crappies is plastic or Gulp and the Gulp not all that often. Way too many people get hung up on live bait when the water is even remotely cool. I use full sized crappie baits as soon as I can make a cast and sometime even under ice if I should happen to lose my mind. I usually just go after them with minnows. Sometimes I can find them shooting docks with jigs but that's pretty rare. Even then, if I find them it's usually has more to do with a lot of luck than any amount of skill haha. I think you all know it's a rare day I crappie fish but that a nice fish you caught there. I did get out Saturday and caught four bass with the biggest around four pounds. I couldn't believe I found 52 degree water. So the bite is on. Time to get out and fish. I drove out to the lake this morning thinking that all the wind and rain we've had over the last few days may not have bothered the fish all that much, but such was not the case. The water is high enough now [well over a foot] that No Wake bouys dot the lake. Where I have been shore fishing the current was nuts this morning. Normally a 50 foot drift takes three minutes or so and today it took about 15-20 seconds. The water was really moving. Plenty of junk was another issue with the water too....grass and reeds were all but making a good drift impossible. The water color was about mud and the water temps had dropped back into the 40 degree range so my wishful thinking was exactly that....wishful. We're three weeks early with the ice-out stuff so the early fishing was a treat. I have the boat ready and will be in it from here on out as after this mess clears up the fish will likely have to be hunted for the next month. I couldn't even get a smallie this morning and they are always willing to come out and play in this location. What do they say? It was fun while it lasted?